I have another new free plugin, Minimum Age for WooCommerce. Use it to enforce a minimum age for customers on your shop. I needed to build this plugin for some clients with wine websites, to meet legislative requirements. 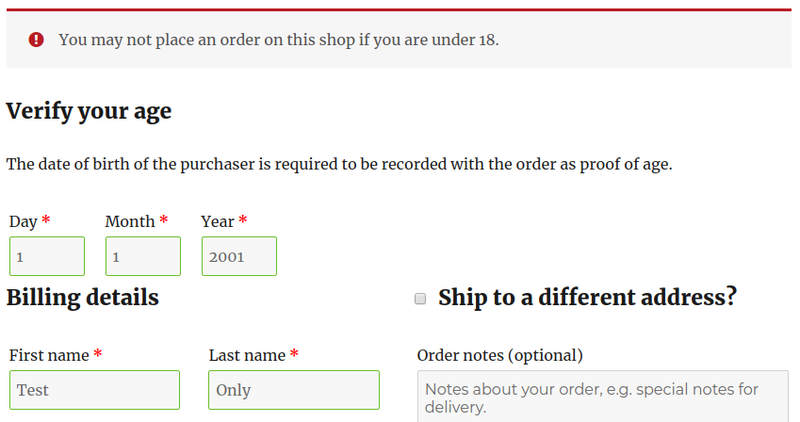 It adds a birth date question to the top of the WooCommerce checkout, and will not complete a purchase if the customer’s age is below the minimum requirement. The minimum age can be changed in the WooCommerce settings, and so can the messages shown on the checkout. All pretty straightforward. The birth date is recorded with the order, for audit purposes. Of course, it can’t prove that the customer isn’t lying, but that’s a separate problem and one generally reserved for the delivery of the product.